One of the most important achievements of the expedition was the mapping of the north east part of Asia. The geography department of the St. Petersburg Academy of Science published in 1754 a map with the title Nouvelle Carte des Découvertes faites par des Vaisseaux Russiens, which also depicted Vitus Bering's and Aleksei Chirikov's sea route. The new geographic information was quickly diffused and received widespread attention in all of Europe. The above is an English map entitled The Russian Discoveries prepared by the London cartographer Thomas Jefferys (this is a reprint published by Robert Sayer in the American Atlas of 1776). The Great Northern Expedition (Russian: Великая Северная экспедиция) or Second Kamchatka expedition (Russian: Вторая Камчатская экспедиция) was one of the largest exploration enterprises in history, mapping most of the Arctic coast of Siberia and some parts of the North America coastline, greatly reducing "white areas" on maps. It was conceived by Russian Emperor Peter I the Great, but implemented by Russian Empresses Anna and Elizabeth. The main organiser and leader of the expedition was Vitus Bering, who earlier had been commissioned by Peter I to lead the First Kamchatka expedition. The Second Kamchatka Expedition lasted roughly from 1733–1743 and later was called the Great Northern due to the immense scale of its achievements. The goal was to find and map the eastern reaches of Siberia, and hopefully the western shores of North America. Peter I had a vision for the 18th-century Russian Navy to map a Northern Sea Route from Europe to the Pacific. This far-reaching endeavour was sponsored by the Admiralty College in St. Petersburg. With over 3,000 people directly and indirectly involved, the Second Kamchatka Expedition was one of the largest such projects in history. Its cost, completely financed by the Russian state, reached an estimated 1.5 million rubles, an enormous sum for the time; roughly one sixth of the income of the Russian state in 1724. The achievements of the expedition included the European discovery of Alaska, the Aleutian Islands, the Commander Islands, Bering Island, as well as a detailed cartographic assessment of the northern and north-eastern coast of Russia and the Kuril Islands. It definitively refuted the legend of a land mass in the north Pacific, and did ethnographic, historic, and scientific research into Siberia and Kamchatka. When the expedition failed to round the north-east tip of Asia, the dream of an economically viable Northeast passage, sought since the 16th century, was at an end. Systematic exploration and scientific discovery in the eastern part of Asia was at the initiative of Tsar Peter the Great (1672–1725). In 1697 and 1698, he traveled in a number of European nations, and became enthused at the idea of a scientific academy in Russia. In 1723/24, he drew foreign scholars to St. Petersburg, hoping to replicate the scientific culture of Europe in his own land and to educate native scholars. Contemporary depiction of the main building of the Russian Academy of Sciences in Saint Petersburg. Plate entitled Cross-section of the imperial library and art room towards morning, taken from a series of twelve etchings published in 1741. They were the first collaborative work from the workshops of the St. Petersburg academy. In December 1725, the institution was inaugurated with celebrations. Young, mostly German-speaking scholars formed the core of the Academy in its first decades. One of their tasks was to organize and eventually accompany scientific expeditions to then-unexplored parts of the empire. During Peter’s lifetime, the German doctor Daniel Gottlieb Messerschmidt (1685–1735) traveled from 1720 to 1727 to western and central Siberia. This was the beginning of investigation in geography, mineralogy, botany, zoology, ethnography, and philology there, as well as an opening-up of the region to trade. Messerschmidt's Expedition was the first in a long series of scientific explorations of Siberia. This undertaking, lasting from 1728 to 1730, was led by the Danish captain Vitus Jonassen Bering (1681–1741), an officer in the Russian imperial navy since 1704. In the ship St. Gabriel, which had been built at the outlet of the Kamchatka River, Bering made two voyages northeast in successive years (1728 and 1729), and at one point reached 67 degrees north, from which point the coast no longer extended north. He failed to reach North America in either trip, due to adverse weather. Despite the new knowledge about the northeast coast of Siberia, Bering's report led to divisive debate, because the question of a connection with North America remained unanswered. This prompted Bering to propose a second Kamchatka expedition. The central goals in Bering's vision for the new expedition was the survey of the northern coast of the Russian Empire; the expansion of the port of Okhotsk as the gateway to the Pacific Ocean; the search for a sea route to North America and Japan; the opening of access to Siberian natural resources; and finally, the securing of Russian sovereignty in the eastern parts of Asia. The conditions for this gigantic project proved to very favourable. Empress Anna (1693–1740), reigning from 1730, wanted to continue Peter the Great's territorial and economic expansion of the empire. The empress issued an Ukase issued on April 17, 1732, ordering a new expedition. This was followed on May 2 and 15, 1732 by two further Ukases from the Russian Senate to the Admiralty ordering the preparation of the undertaking, and the commissioning of Vitus Bering as its commander. Another Ukase on June 2, 1732 obligated the Russian Academy of Sciences to prepare instructions for the scientific component of the journey. A further Ukase on December 27, 1732 concerned the organization and the formal commissioning of the expedition. The expedition was separated into three groups, each with further subdivisions. The mission of the northern group was to measure and chart the northern coast of Russia between Archangelsk on the White Sea and the Anadyr River in eastern Siberia. The completion of this mission set the foundations for determining the status of the north east passage as a possible connection between Europe and the Pacific Ocean. It was seen as a possible alternate for the land transport used in Russia's trade with China.From "Joao-da-Gama-Land", Bering's group was to set out farther east to the coast of North America. The second Pacific division was under the command of the Danish captain Martin Spangberg died 1761, who had accompanied Bering on the First Kamchatka Expedition, and had been charged with exploring the sea route from Okhotsk to Japan and China. The academic portion of the expedition was led by three professors from the Russian Academy of Sciences. Johann Georg Gmelin (1709–1755) was responsible for research into the plant and animal world as well as the mineral characteristics of the regions to be explored. Gmelin was a natural philosopher and botanist from Württemberg, who had studied in Tübingen and had researched the chemical composition of curative waters. At the urging of his former teacher Georg Bernhard Bilfinger (1693–1750), Gmelin had moved to Russia with him in 1727. There he received a teaching post in chemistry and natural history in 1731. The Academy chose the German historian and geographer Gerhard Friedrich Müller (1705–1783) to head the geographic and historical studies. Müller had studied in Rinteln and Leipzig and had gone to St. Petersburg in 1725 on the recommendation of a colleague. He became an extraordinary professor in 1730, and a year later was promoted to full professor. He researched Russian history intensively, resulting in the publication in 1732 of the first volume of the Collected History of Russia. Because of Müller's haughty bearing as the chancellor's secretary, there was frequent friction between him and his colleagues. His participation in the expedition was due not only to his desire to have access to historical sources through the expedition, but to spend some time away from St. Petersburg. It was while engaged in this trip that he developed his concept of Ethnography. On the suggestion of the astronomer Joseph Nicolas Delisle (1688–1768), who had been hired by Peter the Great to work in St. Petersburg, the Academy of Science entrusted the job of astronomical and geographic metrology to Delisle's younger brother, Louis De l'Isle de la Croyère (1690–1741). Louie had been working at the Academy as an adjunct for astronomy. In 1727 he was promoted to professor and was sent on a three-year exploration survey of Arkhangelsk and the Kola peninsula, giving him some experience in exploration expeditions. Croyère's participation in the academic portion of the expedition later became controversial when his competence was questioned by Gmelin and Müller. The participants in the academic portion of the expedition were answerable not to its leader Bering, but to the St. Petersburg academy. Each of the professors received a precise commission in regard to the accomplishment of his research program. The directions given to Croyère and his geodesists were written by his brother Joseph Nicolas. Gmelin wrote the instruction for his own research work in natural history. He received further instructions from the anatomist Johann Georg Duvernoi (1691–1759), who had been part of the teaching faculty in Tübingen, as had Georg Bernhard Bilfinger. Among other things, Duvernoi wanted to find out whether the peoples of Siberia could move their ears, whether their uvulas were simple, or split into two or three parts, whether Siberian males had milk in their breasts, etc. The physicist Daniel Bernoulli (1700–1782) authored instructions intended for Croyère and Gmelin about the carrying out of series of physical observations. The historian Müller drafted his own plan of work. His chief goals consisted of researching the history of all the cities the expedition would visit and collecting information about the languages of the groups they would meet along the way. The painters Johann Christian Berckhan (died 1751) and Johann Wilhelm Lürsenius (died around 1770), both of whom were part of the academic component, got special instructions. The academy directed all the researchers to prepare reports about the state and the results of the expedition in Russian and Latin. The academic component of the expedition was provided with many astronomical, geodesic, and physical measuring instruments to pursue its research. The governor of Siberia and the various local authorities were ordered to provide the researchers all the aid they required. The two Pacific divisions of the expedition, led by Martin Spangberg and Vitus Bering, left St. Petersburg in February and April 1733, while the academic group departed on August 8, 1733. In addition to the Academy members Gmelin, Müller and Croyère, the group also included the Russian students Stepan Krasheninnikov, Alexei Grolanov, Luka Ivanov, Wassili Tretjakov and Fyodor Popov, the translator (also a student) Ilya Jaontov, the geodesists Andrei Krassilnikov, Moisei Uschakov, Nikifor Tschekin and Alexandr Ivanov, the instrument maker Stepan Ovsjanikov, and the painters Johann Christian Berckhan and Johann Wilhelm Lürsenius. Two soldiers accompanied them for their protection, together with a corporal and a drummer. The group used horses as land transportation and barges on water. The academic component's travel route took them first to Novgorod, Kazan, Jekaterinburg and Tyumen to Tobolsk, where they arrived in January 1734. In May, Gmelin and Müller separated from the rest of the group, who were put under Croyères' leadership, and travelled until December 1734 to the Irtysh River, and then onwards to Semipalatinsk, Kusnezk near Tomsk, and then onto Yeniseysk. Passing through Krasnoyarsk and Udinsk, they reached Irkutsk in March 1735. They left a portion of their baggage train there and began to survey the area around Lake Baikal. They studied trade in the Sino-Russian border city of Kyakhta in Transbaikal and visited the mines near Argun. They then returned to Irkutsk for the winter. In the meantime, Müller located and investigated area archives and made copies and transcriptions, while Gmelin studied plants he had collected over the course of the summer. View of Irkutsk. Pencil drawing from 1735. Their next destination was Yakutsk, where the participants in the academic component were to meet with Bering and were then meant to travel on to Kamchatka together. After their departure from Irkutsk, the two scholars journeyed along the icy Angara River to Ilimsk, where they celebrated Easter. When the Lena River was free from ice, they resumed their voyage, travelling downstream with boats. They reached Yakutsk in September 1736. Almost all the members of the two Pacific divisions of the expedition had gathered there in the meantime, and as a result, Gmelin and Müller experienced difficulties in locating accommodation. Mock-up of the ship St.Peter which can be seen in The Russian Black Sea Fleet Museum in Sevastopol. In June 1741, the St. Peter and the St. Paul set sail from Petropavlovsk. Six days later they lost sight of each other in a thick fog, but both vessels continued to sail east. On July 15, Chirikov sighted land, probably the west side of Prince of Wales Island in Southeast Alaska. He sent a group of men ashore in a long boat, making them the first Europeans to land on the northwestern coast of North America. When the first group failed to return, he sent a second, which also vanished. Chirikov weighed anchor and moved on. 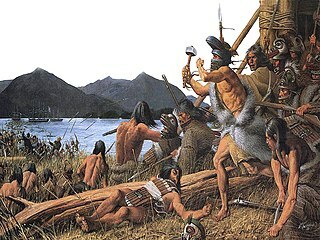 Bering's first encounter with Aleuts at Shumagin Island. Drawing by Sven Waxell, the mate of Bering's ship St. Peter. On roughly July 16, 1741, Bering and the crew of St. Peter sighted a towering peak on the Alaska mainland, Mount Saint Elias. Bering was anxious to return to Russia and turned westward. He later anchored his vessel off Kayak Island while crew members went ashore to explore and find water. Georg Wilhelm Steller, the ship's naturalist, hiked along the island and took notes on the plants and wildlife. He also first recorded the Steller's jay that bears his name. Chirikov and the St. Paul headed back to Russia in October with news of the land they had found. Bering's ship was battered by storms, and in November his ship was wrecked on the shore of Bering Island, which many of the crew thought to be the coast of Kamchatka. Bering fell ill with scurvy and died on December 8, 1741; soon after, the St. Peter was dashed to pieces by high winds. The stranded crew wintered on the island, and 28 crew members died. When weather improved, the 46 survivors built a 40-foot (12 m) boat from the wreckage and set sail for Petropavlovsk in August 1742. Bering's crew reached the shore of Kamchatka in 1742, carrying word of the expedition. The sea otter pelts they brought, soon judged to be the finest fur in the world, would spark Russian settlement in Alaska. Wikimedia Commons has media related to Second Kamchatka Expedition. ^ Hintzsche / Nickol, Die Große Nordische Expedition, p. 200. ^ The traditional idea of the motivations behind the First Kamchatka expedition was the search for a land bridge. See, among others, Raymond H. Fisher in his 1977 book Bering's voyages: whither and why. In contrast to this view, Carol Urness claims that the mapping of the eastern parts of Russia was the main goal. See Carol Urness: The First Kamchatka Expedition in Focus, in: Møller / Lind, Under Vitus Bering's Command, Århus 2003, p. 17–31 (Summary of the thesis presented in the 1987 book Bering's First Expedition: A re-examination based on eighteenth-century books, maps, and manuscripts). ^ Hintzsche / Nickol, Die Große Nordische Expedition, p. 78. Georg Wilhelm Steller was a German botanist, zoologist, physician and explorer, who worked in Russia and is considered a pioneer of Alaskan natural history. Johann Georg Gmelin was a German naturalist, botanist and geographer. Stepan Petrovich Krasheninnikov was a Russian explorer of Siberia, naturalist and geographer who gave the first full description of Kamchatka in the early 18th century. He was elected to the Russian Academy of Sciences in 1745. The Krasheninnikov Volcano on Kamchatka is named in his honour. The Pacific Northwest coast of North America was one of the last coastlines reached by European explorers. In terms of sailing time from Europe, it was one of the most distant places on earth. This article covers what Europeans knew or thought they knew before the area was explored by Captain Cook in 1778.